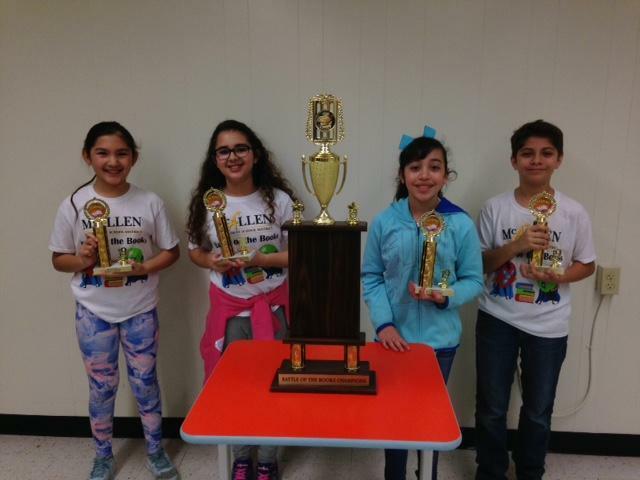 The Perez Battle of the Bluebonnet team won first place in the McHigh Vertical Team Challenge. Then, they went on to face the other vertical team winners. They emerged victorious in the final battle after a come from behind win. Congratulations to our team members: Alyssa Leija (Captain), Jake Tijerina, Ayda Balci, and Rachael Teixeira. All of our team members did an outstanding job to contribute to this win. The Perez Battle of the Bluebonnet team won first place in the McHigh Vertical Team Challenge. They lead the competition from the start and never gave up their lead. A few days after that competition, they faced the other vertical team winners to determine the district champions. They emerged victorious in the final battle after a come from behind win. Congratulations to our team members: Alyssa Leija (Captain), Jake Tijerina, Ayda Balci, and Rachael Teixeira. All of our team members did an outstanding job to contribute to this win.